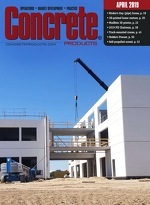 Concrete Products - Innovations gives an in depth look at new and exciting concrete equipment and technology. Mack Trucks has unveiled the MP8HE 13-liter engine and HE+ package for its Anthem model series, noting the potential for a 9.5 percent improvement in fuel efficiency and Environmental Protection Agency SmartWay designation. Product engineers present Pave Edge as proven restraints that withstand greater loads, exhibit lower deformation and require fewer spikes than typical systems. PVC plastic construction affords the restraints superior strength and memory, they add, while a patented lip design means the edging will stay in place through the ground’s frost heave movement and help keep sand where it is meant to be. A dual-action, non-yellowing compound for exterior, broomed concrete, Pencure OTC is clear, transparent, and easy to apply. The Oldcastle Precast plant in Perris, Calif., recently deployed a pair of Shuttlelift Double Beam 90 Series rubber-tired gantry cranes. The 180,000-lb. capacity machines’ custom spreader assemblies enable crews to lift a wider variety of products than prior models; allow cranes to work independently or in tandem; and, equip the plant for future transportation market structures. Material handling equipment manufacturer’s newest offering bears a safe, easy-to-use electric propulsion system, requiring no certification, and 24V rating to easily move up to 750-lb. loads indoors or outdoors. The Motorized Hopper Cart suits bulky and oversized loads. With three different tub sizes and wheel options, users can customize the cart for their specific application. Tub contents can be dumped by pushing up on the handles bars or the hinged tub can be lifted manually.